Nice morning for a swim. 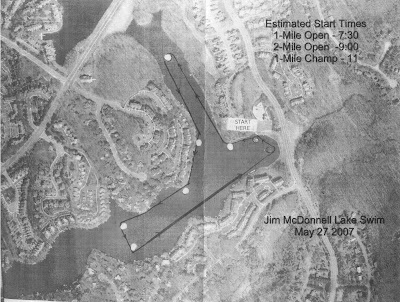 Today, Sharon and I took off early to go compete in the Jim McDonnell Memorial Two-Mile Lake Swim in Reston, Virginia. This is a fun little swim, but navigating around the buoys can be tricky. Sighting them from afar is often hard to do in blurred goggles, so I find myself zig-zagging down the course. All told, it probably means I did a 2.2 mile swim if you add up all the zig-zag yardage. Here's a map of the course. Swimming the two mile event, we had to go around the course twice. The first lap is always the hardest. It took me a while to get in my groove, but I finally got in sync and the second lap went much easier. I finished the course in 1:05, not a really good time for me, but admirable considering it's been three years since my last two-mile swim. Swimming with Sharon was fun. I probably wouldn't have signed up for the race had she not asked me to do it with her. I was happy to oblige, and I forgot how much I like these races, despite the fact that before the race, I curse myself for signing up--just a few butterflies in the stomach. Sharon and I agreed to sign up for the Montclair race in September. This is a really nice race, heralding the end of summer. The setting is nice; they have a sandy beach and the kids can play all day while we swim. Something to look forward to later this year. Thanks to Desi for the video as I emerge from the lake, looking not quite enough like Steve Austin. Tell me about zig-zagging... that looks really fun! Scott your workouts are paying off, wow!-- keep it up! Sharon looks like a hard one to beat! Ok, this is just me being me, but I laughed out loud at the 3dfx hat. That's hysterical. I didn't realize Sharon was a swimmer too. Your workouts are paying off! !